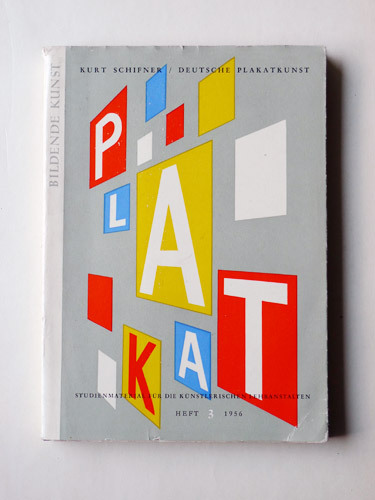 Plakat book cover designed by Klaus Wittkugel. Photo: Prem Krishnamurthy. This research project seeks to initiate critical discussion on the role of political ideology in design history by examining the near-forgotten life and work of East German graphic designer Klaus Wittkugel (1910–85). Through his work as head designer for the GDR's Office of Information and his designs for book covers, posters, packaging, and exhibitions, Wittkugel established himself as a leading communicator of socialist economic, political, and cultural objectives. He combined modernist photomontage and typography with a strong understanding of space and public participation to design and coauthored immersive propaganda exhibitions promoting East Germany and antagonizing the West. Wittkugel also designed signage, installations, and identities for several East Berlin architectural icons. His significant body of work has been overlooked because its ideological content does not fit into the existing canon of twentieth-century graphic design. This research is preparation for an exhibition and catalogue to encourage dialogue about these crucial issues. Prem Krishnamurthy is a designer and curator in New York. He is a founding principal of the design studio Project Projects, which was a finalist in the 2009 and 2011 Cooper-Hewitt National Design Awards. The studio's clients include the Canadian Centre for Architecture, Guggenheim Museum, Harvard, MoMA, SALT (Istanbul), Steven Holl Architects, Vera List Center for Art & Politics, the Whitney Museum of American Art, and the Yale University Art Gallery. After studying graphic design and photography at Yale and completing a Fulbright Fellowship in Germany, Krishnamurthy worked in Berlin and New York. He is an editor of the art journal Paper Monument. Krishnamurthy has lectured and taught at institutions and symposia including the GAMeC Symposium of Emerging Curators, Walker Art Center, SALT Beyoglu, AIGA, RISD, Parsons School of Design, Yale School of Art, Columbia Graduate School of Architecture, Academy of Fine Arts Vienna, University of Art Bremen, Jan Van Eyck Academie, and Bauhaus University Weimar.